It is officially Halloween!!! That means one more orange and black mani for the road. I used a mix of stamping and water transfer decals for this look. And of course a cabochon bow from +Bundle Monster! Love those. I received the Halloween water transfer decals (pattern 189) in exchange for an honest review from Born Pretty Store. I'm extremely happy with them. The images are really cute, which is always a major factor, but the quality is amazing as well. Sometimes when decals have white elements, they can be transparent, but that is not the case with these. As you can see in my mani, the moon and the ghost show up nicely over the base colors. The decals themselves are very fast and easy to apply, and I did not experience any wrinkling. Another nice feature is that each image comes in two sizes, so they are versatile for both short and longer nails, as well as usable on all nails from pinky to thumb. I'm only sad I didn't get these sooner so I could have used them more! I used the haunted house and ghost with bats, but other images include a spider web, a witch hat, and a ghost with a tombstone. 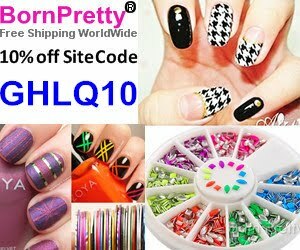 For these or other nail art supplies, be sure to use coupon code GHLQ10 for 10% off on your purchase. Sephora - To The Glitter End! Apply the base colors - index in Slick Black, the rest in Orange. Apply one coat of UFO to the pinky and thumb. Affix the water transfer decals per their instructions, to the index and pinky. Using Black Noir, stamp the Halloween words background (BM-H07) to the middle finger. Apply a few coats of To The Glitter End! to the ring finger. Glue an orange bow cabochon to the base of the ring finger. Don't forget to use coupon code GHLQ10 for 10% off!